Diverse mix of Asians and other ethnicities, lots of opportunities to meet singles simply to chat or hang-out with. The wide range of cultures means if you are looking for a certain Asian ethnicity it can be more difficult to find. A busy dating community for Asian women and men, AsianDating with its 300,000 users makes it relatively easy to meet and match with singles. In my experience the site’s diverse community is split between local Asian, European/Americans, and Asian expats. I recommend that you make the most of the freebies before upgrading. I found AsianDating to be a cross between a casual dating network and a foreign marriage site. It is a well-populated community, currently having around 300,000 single women and men to choose from. The “membership pool” is a mix of 1) non-Asians (mostly men) looking to hook-up with pretty, young Asian females; 2) Asians using the site locally – who tend to go on there and use it as a social network; and finally 3) Asian expats, mostly looking to meet up with others of their particular ethnic background. 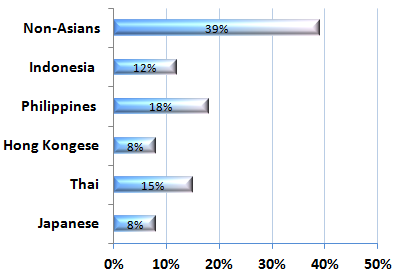 Of the three groups of typical users, I would say Pilipino, Thai, Indonesian and Chinese (Hong Kongese) make up the majority of its Asian members; however of course there are many different nationalities to be found within such a diverse community. I should say as well that this is just based on my own small survey. For non-Asian men, there’s actually a fairly decent number of women seeking to meet partners from abroad for foreign marriage or simply relationship prospects. AsianDating is well geared-up towards these types of relationships. You’ll even find the necessary pre-marital IMBRA forms (which is a requirement for fiancé visas in certain countries – notably the U.S.). I recommend as always setting up a clear, concise photo profile with at least one face photograph. My first profile was terminated! Probably because I hadn’t added enough detail. To thwart scammers, they do responsibly have a strong moderation system in place. On the plus side, this does greatly reduce the number of scammers getting in, and will ultimately make your dating experience that much safer. Using the Free Account: The free account will give you ample opportunities to explore and possibly hook-up with some singles before deciding whether to upgrade – this is where having an exceptional photo profile comes in handy. If you haven’t paid for premium access you’ll need to rely on other people finding you and initiating contact. You can reach out to other members, but can only email those who’ve upgraded. Winks and flirts are possible but in my experience these tend to be ignored (possibly due to being used excessively by scammers). I found it pretty easy to make a few friends and get chatting with people after a few sessions. On some sites it can take perseverance but the AsianDating community does seem particularly friendly – as other Cupid sites link Chinese Lovelinks (read review). I do recommend sticking with the free account just until you figure out if the site’s really “up your street”. If it isn’t you haven’t lost anything. Upgrading Is it Worth It? Instant messenger: The main downer in remaining with the free account is however that you won’t have access to the instant messenger system. I’ve found this to be a great way to break the ice – simply send a quick “hello” message to someone who’s online. Unlike emailing, you’ll get an instant response and usually know right away if “things are worth pursuing”. Video: Additionally, full members have access to user’s videos. While you can upload your own video, you won’t be able to view anyone else’s – which is a big downer in my opinion. Unlimited communication: Finally the biggest reason most will upgrade is pure frustration at the inability to communicate with everyone. While you may be lucky and receive enough “romantic” interest from premium members, others may not be so fortunate. A friend of mine had his profile up for around 6 weeks – but wasn’t able to connect with anyone. I did find AsianDating to be a pretty fun place to hang-out. I must admit I did have some misgivings about it at first – when I saw other people’s comments about it being a “mail order bride” service. However I think it does offer possibilities for people to make romantic connections as well as discover serious marriage type relationships. Gender mix: Unlike other Asian cultural websites in this genre, AsianDating.com does have a healthy mix of men and women – rather than being hugely overpopulated with one gender (most typically male), it does seem to have a roughly equal number of men and women so striking the balance right. Helpline: The company also provides 24×7 support which is available to all (not just paying members). The cost is little high but I know if I want the best result then I have to pay the bill too. Nothing gets easily in our life. I used a 3 month Gold profile. I hope I will find my desired cute Asian woman.